available for DOWNLOAD or on CD-ROM, lists and provides information for ALL of the towns, villages, cities, places, settlements, and place names associated with the region called KARPATALJA also known as PODKARPATSKA RUS, RUTHENIA, SUBCARPATHIA, SUBCARPATHIAN RUS, TRANSCARPATHIA, CARPATHO-UKRAINE, ZAKARPATSKA, ZAKARPATIA or ZAKARPATTIA and ZAKARPATTYA. Comprised primarily of the four north-eastern counties of the old Kingdom of Hungary including Bereg, Maramaros, Ugocsa, and Ung megyes/vármegyes, throughout history, the area currently referred to as Zakarpatska Oblast in the Ukraine has been known by many different names. To the Hungarians, it has always been called Karpatalja. 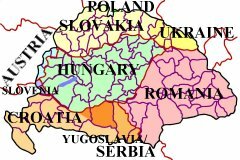 After World War I, when the Kingdom of Hungary was broken up under the Treaty of Trianon in 1918 and the new country of Czechoslaovakia was formed, the region was called Podkarpatská Rus, Ruthenia, or Rusinsko. Following World War II, when it came under the rule of the Soviets as part of Ukraine, the region came to be known as Transcarpathia and Zakarpatt'ja. Today, depending on where you are and who you are talking to, it is still called by all of these names as well as others including Karpatho-Ukraine, Carpatho-Ukraine, Subcarpathia, Sub-Carpathian Rus, Zakarpatt'ja, Zakarpattia, Zakarpatia and Zakarpatska. Like the region in which it lies, it is quite possible for the village of one's birth to also have acquired several names. Although in a person’s lifetime they may have never lived anywhere else, a record of baptism in 1916 might show Kisgejõcz, Hungary as the birthplace, Malê Gejovce, Czechoslovakia as the place of marriage in 1935, and in 1978, Mali Hejivci, Ukraine as the place of death. Nor would it be unusual for changes in governments, policies, laws, etc., to create new variations for an old name. Thus, Kisgejõc, Kis Gejõcz, Kisgeõcz, Kisgeõc, Kis-Gõcz, and its current name Maloye Geyovtse, along with those mentioned earlier, are all one and the same place. 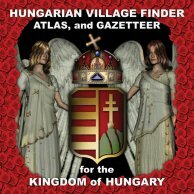 The HUNGARIAN VILLAGE FINDER, ATLAS, and GAZETTEER for the KINGDOM of HUNGARY (HVF)-contains place names / placenames in Croatian, German, Hungarian, Polish, Romanian, Slovakian, Slovenian, Ukrainian, and Serbian--along with alternate spellings, native names, official names, Magyarized names, old and new names, and former and current names. Also included are the names and locations of smaller settlements such as pusztas, csardas, tanyas, etc., ALL alphabetized using the Arabic alphabet (English) into single, comprehensive indexes. In other words, YOU do not need to know what language a learned place name is in order to locate it in the HVF!